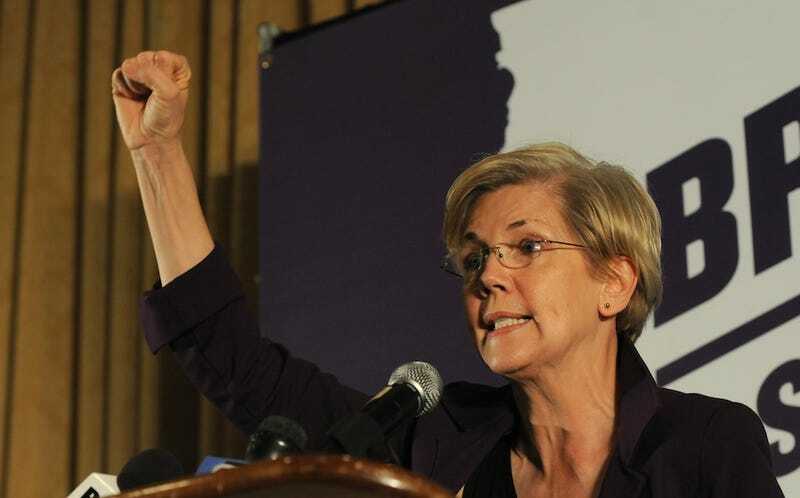 Ever since she first rose to national prominence, all of my most tree huggingly liberal friends and family members have been positively giddy about the idea of a Democratic Party helmed by people who think and act like Massachusetts Senator Elizabeth Warren, a sharp and staunch advocate for the middle class. Well, as of today, they're a little bit closer to getting their wish. On Thursday, Senate Republicans unanimously picked bespectacled turkey neck Mitch McConnell as their Majority Leader (no surprise there, despite some election night Ted Cruz saber-rattling). Democrats went with the Old Dude Who Has Had The Job For Awhile route, too, again selecting Harry Reid to lead their party in the Senate. But they also got some new blood into Senate leadership. Sens. Amy Klobuchar (MN) and Elizabeth Warren were both selected to fill policy advisor roles. Klobuchar and Warren join the two other Democratic women currently serving in Senate leadership, Patty Murray (WA) and Debbie Stebenow (MI). Writing in the New York Times, David Firestone expressed some reservations about Warren's new role, but hope for her future and the future of the Democratic party. ... senators and their aides are telling reporters that she will act as a "liaison to liberal groups," which sounds a bit like an ambassador to a distant country. Tell us, senator, what your liberal friends will say if we do this or that. A mere liaison is not what the Democrats need right now. The right wing is already talking about entitlement cutbacks, givebacks in corporate taxes, and undoing financial regulations. If Ms. Warren is allowed to become the voice of Democratic opposition to the worst Republican policies, she may just help lead the party out of the wilderness. GIVE HER ALL OF THE JOBS! The Washington Post wasn't very impressed, either, calling Warren's new post one in a series of "conveniently invented leadership roles." Republicans, meanwhile, will soon boast six women among its Senate ranks, the most GOP women to ever concurrently serve in the Senate.